One of the best parts of having a baby is watching them learn and grow. Fox is constantly recognizing letters, saying new words, learning new skills and making connections every day. It is exciting and fun to see him discover new things. I have just recently decided to let him help me in the kitchen. Obviously I don't let him do anything that requires sharp tools or the stove/oven, but he loves scooping and adding ingredients to mixing bowls, and stirring mixtures together. In a large bowl, combine the butter, sugar and egg. Mix for a minute or two until fluffy. Add the vanilla extract and mix again until well combined. In a smaller bowl, combine your flour, baking powder and salt and stir until evenly distributed. Add the dry mixture to your wet mixture in three parts, stirring a few times between each addition of dry mixture. Mix until just combined. Refrigerate from 30 minutes to overnight. In a stand mixer, combine the butter, oil, sugar, vanilla, salt until it is just barely smooth. Add the egg, and mix again until just combined. Add the cornstarch, cocoa powder, and flour all at once, then beat until it just comes together. Refrigerate for 30 minutes to overnight. Remove the dough from the fridge about 10 minutes before you are going to use it. Break off small pieces of the white dough (about the size of a golfball) and roll into skinny snakes (about 1/2 inch in diameter). You will want about 6-8 of these white snakes. Dust a clean counter with flour. Break off a golfball-sized piece of the brown dough and roll it out with your hands into a thick snake (reconnect with your play-dough days). 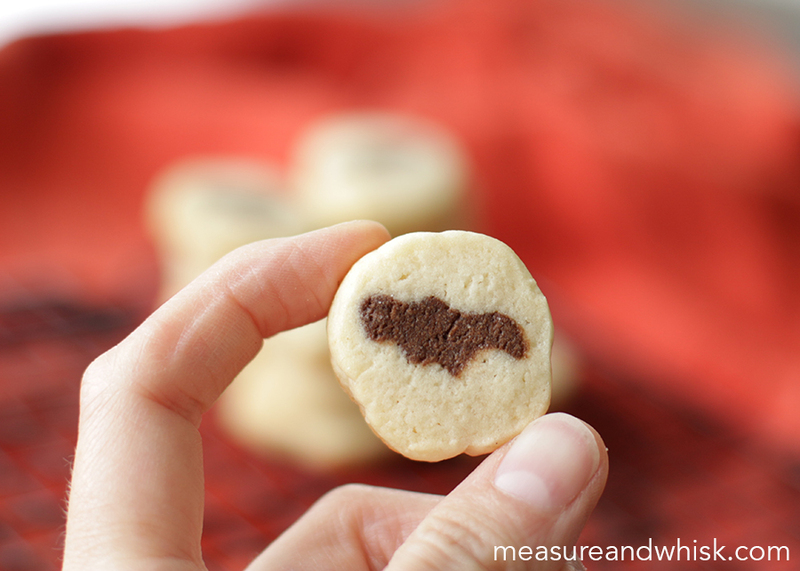 With a wooden dowel or shish-kabob stick make indents lengthwise in your brown dough to create a bat. You want two indents on the top half of the circle and three on the bottom half. Now take your skinny white snakes and lay them in the indents to help your dough hold its shape. Once you have all your snakes in a bundle (with the brown bat shape in the middle), roll your entire log on your floured surface until none of the brown shows through the white cookie on the outside. Add a little more white cookie dough if necessary. Wrap your dough in plastic wrap (or a silicone mat), and refrigerate for 30 minutes. 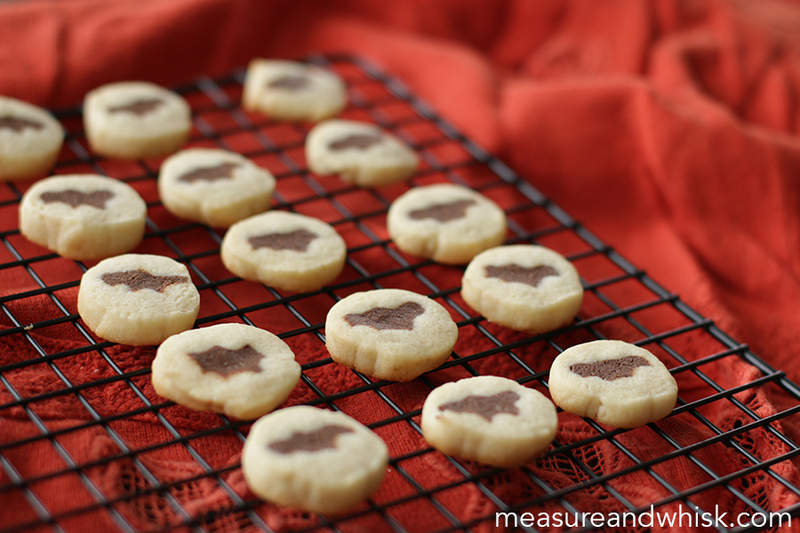 Remove from the fridge, preheat your oven to 375°F, and chop off the ugly ends of your cookie roll. 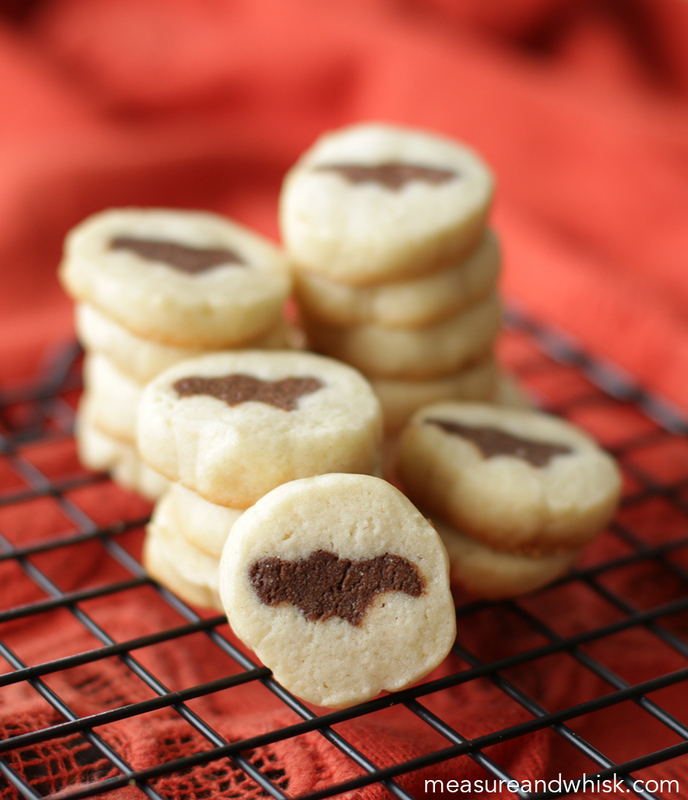 Now cut 1/4" cookie wheels, each with a tiny bat in the center. Bake on a silicone mat for 9-11 minutes until the edges of the cookies are just beginning to turn a golden brown. Remove from the oven, let them cool for a few minutes, then eat to your heart's content! This was such a cute video! Fox turning on the KitchenAid by himself was KILLING me. Loved it when he tossed the batter across the room. Very fun video, and PERFECT music!! It gets really fun when you have two or three around you all wanting a turn to help! I miss those days. Now I cook with !y grandchildren when I get the chance. Thanks for sharing this. 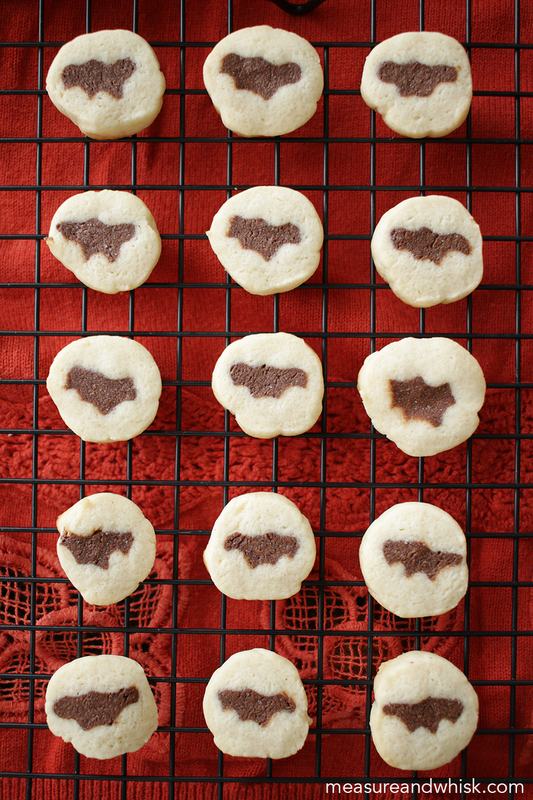 The bat cookies are cute, too.